Sept. Sunday 4, 1864 Near LoveJoy Station Ga. It is very quiet all around the lines today. I was out aforagin & I wash my cloths to day. all of our comesary trains move back to Atlanta to day. is thought that the Army, of the Tenn. will move back to East Point 5 miles S.W. of Atlanta within a day or two as near as I can learn is 30 miles from here to Atlanta north of [there?]. 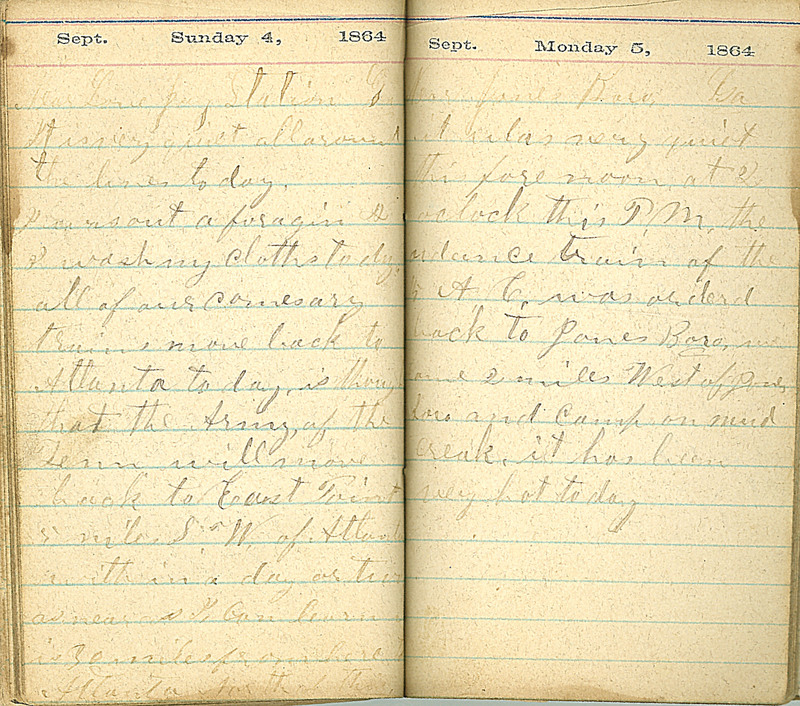 Sept. Monday 5, 1864 Near Jones Boro, Ga. it was very quiet this forenoon. at 2 oclock this P.M. the ordance train of the [15?] A.C. was orderd back to Jones Boro. we land 2 miles West of Jones Boro and Camp on mud creak. it has been very hot to day.